The purpose of any e-commerce website is to make finding and buying products as easy and convenient as possible for visitors. More and more, consumers are using on-site search to find what they are looking for quickly. And, you may be already familiar with statistics saying that a visitor who searches your site is more likely to buy from the online store than one who doesn’t. “combined” search type (like + full-text). In the standard Magento configuration search type is set to “like” that, actually, doesn’t produce impressive results due to its “nature”. This search type produces results similar to the keyword that is entered. For example, if you are selling online such products as tracksuits and swimsuits, and the customer on your website enters the word ‘suit’, to the visitor will be suggested all items where the product names have the word ‘suit’ in them. This search method isn’t based on ‘relevance’ so it is not the most accurate method of searching. The “full-text” search method will indeed return a much more focused results and not only partial matches. But this search type has a huge disadvantage. If the customers mistype, they will never get the expected results. When improving the native Magento search we would rather recommend activating the third search type “combined”, as it uses the power of “like” and “full-text” search options at the same time. When it comes to Magento Enterprise websites, their search capabilities are more advanced than in Magento Community, as they are supported by Apache Solr search engine. In more details we will consider this platform a little bit later. There is one more way to optimize Magento native search. It is time-consuming, but worth it: take your time with the data and configure attributes to match the consumers’ behavior on your website. Gather information, and analyze-analyze-and-analyze it! Consider what terms are your visitors searching for most frequently on your site? Where do they make mistakes? How can you help your customers to find the products they are looking for? And, then based on the results of your research improve your website’s search. Relevance of search results is key for user trust and loyalty. It’s clearly important that your customers need to be able to find the products they are looking for when they search your site. If they don’t, they will look elsewhere. All the work and time you’ve spent will be for naught. It’s common for people to make spelling mistakes when searching for items. Error tolerance, by understanding typos and misspelling, dramatically improves user experience and keeps the user on your website. It is good option to show the misspelled search term alongside the correct spelling. It is great ability to add synonyms for search queries so that customers will be presented with terms that are commonly used across the catalog. For example, if the term “bike” is not commonly used in attributes that are indexed in search, you can have this as a synonym for “bicycle” if that is a very common term used in product names and descriptions. Auto-complete suggestions are great time savers for shoppers. This feature lets store visitors see the list of the most relevant results right after the first characters are entered into the search box. The results are usually arranged and displayed in a search box drop-down menu. Auto-complete for site searches is especially worth considering if you have numerous products. You can also display recommended results inside the search box that match to the auto-completed search queries, enabling customers to click directly into a product’s detail page without having to look through a search results page. None likes waiting. Even very loyal customers. If the customers have to wait for the search results too long, there are two scenarios: 1. They leave; 2. They get frustrated. Both scenarios are not good. So to this issue should be included in your “what-to-improve-list”. Apache Solr is an open source search platform. In comparison to the standard search of Magento, Solr differentiates itself through a significantly higher performance. Its major features include powerful full-text search, faceted search and filtering, hit highlighting, database integration, rich document handling, and geospatial search. Sphinx is an open source full text search server and for those who might confuse it with the Great Sphinx of Giza, Sphinx is the acronym for SQL Phrase Index. Sphinx search has a lot of advantages like high relevancy, flexibility of sorting results, performance and allows normalizing the spelling variations, synonyms and abbreviation. This powerful search engine is used by different popular websites, such as Craigslist.org, mysql.com, joomla.org, tumblr.com, Dailymotion.com. etc. ElasticSearch is a flexible and powerful open source, distributed, real-time search and analytics engine. This search engine is the second most popular enterprise search engine. It provides scalable search, has near real-time search, and supports multitenancy. 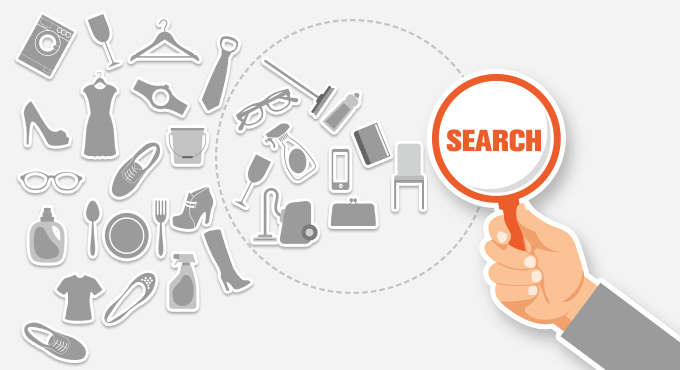 Sooqr is a paid service that enables extreme fast search for online shops. It generates relevant results, the spelling corrector ensures that the search takes place using the right term, keeps track of the way your visitors search, so the website owners can get a really good insight of the usage of your site search. Learning Search is an advanced, SaaS-based site search solution. SLI is an acronym meaning “Search, Learn and Improve”. SLI Systems’ patented learning technology that learns from visitors’ site search activity and clicks to deliver the most relevant results. By tracking every query and clicks, Learning Search improves relevance and reduces the time it takes customers to find what they’re looking for. It has many more great functions. There are more than 150 extensions currently available on Magento’s official marketplace Magento Connect that cover almost every aspect of search process and offer functions you sometimes even do not think of. Every day several new extensions developed by Magento partners and enthusiasts are added. Which one to choose? It’s so easy to get lost among the variety of search extensions. So we decided to help you out with this a little bit. We have listed 10 of the extensions that can be useful for your website. Ability to limit searched items displayed in the dropdown list etc. This extension replaces standard Magento search and uses Sphinx as external search engine, so it has all the advantages of this search engine. As a result you will get a faster search, a decreased server load, and more trustworthy results. High searching speed of over 500 queries/sec against 1,000,000 SKUs. Searching speed of over 500 queries/sec against 1,000,000 SKUs. Take the advantage of additional search features and boost your conversions! You have not found the right solution for yourself. We can help you with this. We provide Magento development services and would be glat to come up with suggestions and help you to implement the needed feature. If you have any question or are looking for someone to help you with Magento search functionality, please feel free to contact us.